Rick Bartow’s graceful artwork adorns the walls of two of Opsis’s recently completed projects – the University of Oregon Ford Alumni Center and the Western Oregon University Health and Wellness Center. He was recently profiled in the Oregonian as he is soon to install a sculpture on the National Mall in Washington D.C. Read the full article below and watch a video of Rick at work at the bottom. 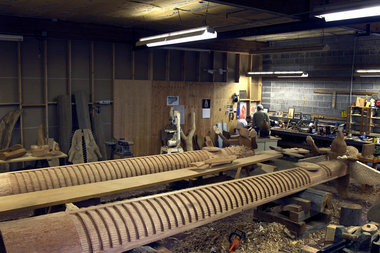 Newport artist Rick Bartow’s ‘pole sculptures’ will stand in place of honor in Washington, D.C.
“We Were Always Here” is a pair of 20-feet-plus tall wooden poles chiseled and carved and coaxed for nearly a year, now ready for their debut next month at the Smithsonian’s National Museum of the American Indian in Washington, D.C. They will face the Washington Monument overlooking the National Mall on Jefferson Drive, says Eileen Maxwell, museum spokeswoman. Bartow is no stranger to acclaim. 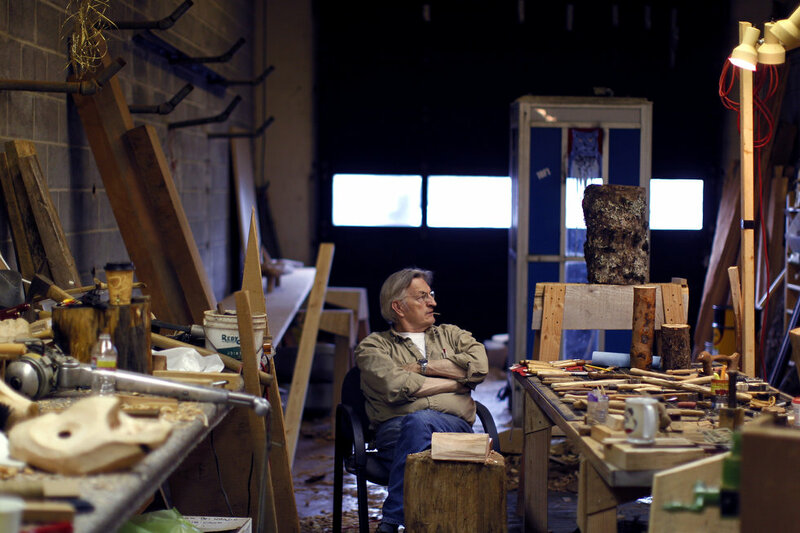 His drawings, prints and mixed-media sculptures have been shown worldwide and his Cedar Mill Pole was displayed in the Jacqueline Kennedy Garden at the White House in 1997-1998. The story begins a few years ago with a humbled Bartow returning from D.C. after being invited to take part in a competition at the museum. He made the short list, but failed, in his words, to win the cake. The hotels, the travel, the time, all for naught. He moved on. But then Bartow got a call. While his work hadn’t won the prize, the maquette — or small model of his work — had caught the eye of the museum staff. Where would he get the wood and how was he going to pay for it? While the Smithsonian commissioned the piece for $200,000, they hadn’t paid him yet, and Bartow had to move fast. “It’s a goofy process where somebody makes an offer and you say yes and then try to figure out how to make yes happen,” says Bartow. Bartow’s partner, Nancy Blair, also an artist, put out a call to friend and renowned carver Loren White, who in turned called Duane Pasco, also a highly regarded artist. Pasco just so happened to have a 350-year-old tree he’d bought from the S’Klallam Tribe near Olympia. But they still needed more wood to make the center plates for the back of the poles. White made another call, and there it was, wood from a 1,200-year-old tree, found at a mill in Vashon Island. Nearly a year later, the carvings await only the finishing touches. They are 22 and 27 feet tall, and weigh, by Bartow’s guess, about 1,200 pounds each. The name on the work will be Bartow’s, but it will be infused with the spirit of a tapestry of friends. David, whose whale design adorns the tail of the British Airway jets, rough-cut the salmon carvings and Japanese printmaker Seiichi Hiroshima prepped one of the poles. “The community came in, friends and family came in, and at one time we had 10 people working on this log, butchers, bakers and candlestick makers,” says Bartow. They aren’t totem poles, but “pole sculptures,” says Bartow, a member of the Wiyot Tribe in Northern California. Ultimately, the poles are about water, says Bartow. “Water is so very misunderstood, so necessary for life, but very crudely used as a resource. It is more appropriately one of our greatest medicines. The waste and misuse of our water resources is criminal as its impact falls to our children and grandchildren. One pole represents the bear — the original doctor in native beliefs; the other the raven, and both feature salmon. There is also an eagle, which in native lore, flies closest to the face of the creator. Around Labor Day, Paden will set out with the poles for Washington, D.C. People invited to the Sept. 21 dedication include President Obama and first lady Michelle Obama, the Oregon congressional delegation, Hillary Clinton, various Oregon VIPS and — of equal import, at least in Bartow’s mind — his blues/folk-rock band, The Backseat Drivers. The article above originally appeared on Oregon Live.